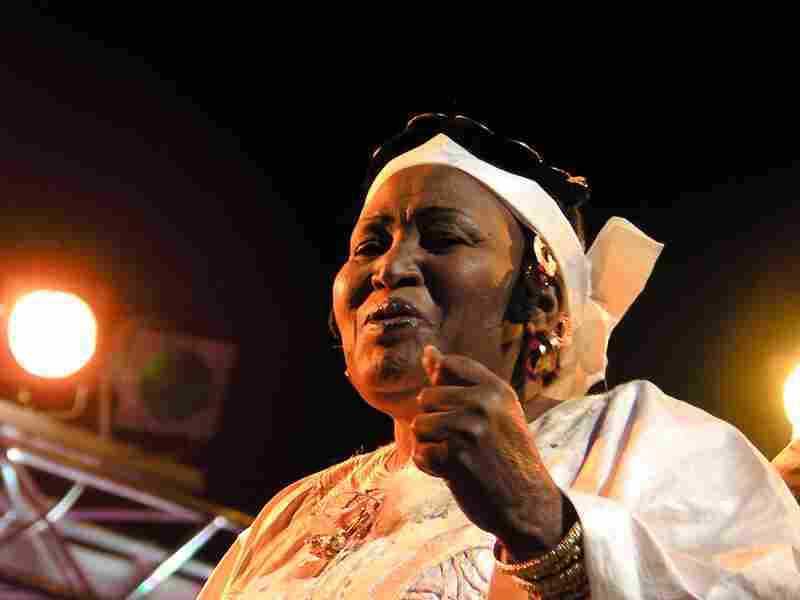 Khaira Arby: Mali's Reigning Queen Of Song As a singer, Arby has opened the door to a generation of artistic women who now follow in her footsteps. In "Waidio," she rails against the practice of female genital mutilation, decrying the "anguish of women" and insisting that they must be free to pursue their own happiness. In "Waidio," singer Khaira Arby insists that women must be free to pursue their own happiness. Khaira Arby is the reigning queen of song in Timbuktu, Mali. She's been writing and singing in the indigenous languages of her Sahara Desert region — Sonrhai, Tamaschek, Bambara, Arabic — for decades. Her robust voice, roiling grooves and direct lyrics, often addressing sensitive issues, have made her a legend in her own time. Arby's debut international CD release (Timbuktu Tarab) and her first U.S. tour are giving Americans their first glimpses of a desert rose. But, as they'll discover, that rose has both a beautiful crimson flower and razor-sharp thorns. Perhaps Arby's greatest social impact in a conservative Islamic milieu has been her advocacy on behalf of women. She divorced a controlling husband to pursue a career in music. (She's since remarried.) As a singer, she's opened the door to a generation of artistic women who now follow in her footsteps. Arby has also sung against the practice of female genital mutilation, and in "Waidio," she decries the "anguish of women," insisting that they must be free to pursue their own happiness. Arby asks, "Why, in a country of beautiful women, do men go to war?" The song showcases Arby's powerful vocal in her first language, Sonrhai, as well as the amazingly tight groove of her electric-guitar-driven band.